If you’ve been paying attention, you’ve noticed that TX vehicles are getting more and more powerful and at the same time are getting better and better fuel efficiency. Much of that’s because of better transmissions. To get a understanding of why that is, let’s turn to gear experts – Dallas bicyclists. A cyclist’s cadence is the number of times per minute he or she pedals. Their ideal pedal speed is the zone where they can most efficiently generate power over a sustained period of time. The experienced cyclist uses his gears to keep his pedal speed in the ideal zone whether he’s climbing a steep Rowlett hill, cruising on a flat stretch or killing a downhill. Look at how it works: if you have a 1-speed bike, you really have to pump hard to get up to speed. And your top speed is limited by how fast as you can pedal. And if you’ve got a hill to climb – forget about it. Now let’s add a couple of gears: one lower and another one higher. With the lower first gear, you can get up to your ideal pedal speed quicker. When you shift to second, your pedal speed drops below ideal for a while as you work to get back to peak efficiency. Same thing happens when you shift to third, but now you can go much faster than you could with a 1-speed bike using the same effort. Add more gears and you can see that it’s much easier to maintain ideal pedal speed. The result, quicker starts, better hill climbing, higher top speed and, most of all, a lot less fatigue for the rider. Like a cyclist, every minivan engine has an ideal engine speed called its power band. When an engine is running in that zone, it can make power very efficiently. It’s the transmission’s job to keep the engine in the power band over a wide range of operating conditions. 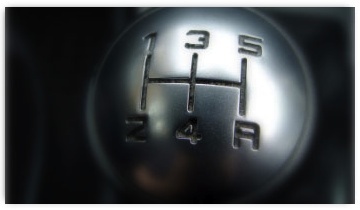 Today 5 or 6 speed automatic transmissions are pretty much the minimum in TX, and 7 and 8 speeds are fairly common. Obviously these sophisticated minivan transmissions are very expensive. In fact, next to your engine, your transmission is the most expensive component in your vehicle, so it pays to take good care of it. Modern transmissions can adversely affect minivan engine performance when they aren’t working right. All car makers have a recommended service interval for changing your old, contaminated transmission fluid. Getting transmission service on schedule at Compton Automotive in Dallas keeps it operating at its best and can prevent expensive damage. Ask your cheerful Compton Automotive service specialist if it’s time for an automotive analysis of your transmission.